Welcome to our Online Services. A variety of online services can be accessed by going on this page and this includes Applying for enrolment (Online Payment & Registration guide), (Online Application Guide) and course enquiries by our prospective students. It provides secure access to College services and your records Online. 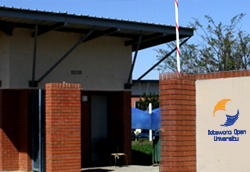 Botswana Open University (BOU) is a result of the transformation of Botswana College of Distance and Open Learning (BOCODOL). The transformation was the actualisation of the recommendation of the Tertiary Education Policy that a comprehensive national distance education institution be established. The institution would develop, offer and accredit university level programmes independently without being tied to collaborating partners. Botswana Open University was developed to meet the growing local demand for ODL tertiary level programmes. The Presidential Directive CAB 37 A of 2011 paved way to BOCODOL’s transformation into an Open University. Subsequently, the Botswana Open University Bill was presented to Parliament and ultimately passed on the 20th July 2017. The Act was consequently signed into law by His Excellency the President of the Botswana, Lt General Dr. Seretse Khama Ian Khama. The transformation to an Open University marks a major milestone in the development of Education for Botswana and a significant step towards realising Botswana’s vision of an educated nation, which also emphasises on the elimination of poverty through the provision of knowledge and skills. BOU is founded in accordance to the Act of Parliament prevailing over the former Botswana College of Distance and Open Learning (BOCODOL). The University’s mandate is to make education accessible to all Batswana especially for the out of school young and adults using Open and Distance Learning (ODL) methodology. Open learning seeks to break down the barriers to personal development by providing flexible learning environments, enabling people to study what is relevant to their needs, at a time and place convenient to them. The University aims to extend education and training using open and distance learning methods on a national scale. BOU offerings will encompass programmes from school equivalency which comprise; Junior Certificate (JC) and the Botswana General Certificate of Secondary Education (BGCSE) to the vocational, management and professional programmes at certificate diploma, degrees and postgraduate levels. The Botswana Open University has its Headquarters in Gaborone, five Campuses in Gaborone, Francistown, Palapye, Maun and Kang. Each campus serves as an administrative support center and provides learner support through the learning centres strategically located across the country. Copyright © 2018 bou.ac.bw. All rights reserved.